Docrates Cancer Center takes advantage of the newest isotope diagnostics and treatments under the leadership of the Chief Physician of Nuclear Medicine Jukka Kemppainen. Radionuclide or radioisotope examinations are based on a radioactive tracer that is introduced to the patient’s bloodstream in various ways. The tracer penetrates via normal metabolism into the organ to be examined. In the target organ, the tracer sends radiation which can be observed by means of a gamma or PET camera, for example. In this way, it is possible to locate any potential cancer metastases and monitor the effectiveness of cancer treatment. Radionuclides are also used in cancer treatment, in which case a radionuclide that has been taken up by the tumor destroys cancer cells through its radiation. In cancer treatment, the development trend is a more precise diagnosis, which strongly affects the success of the treatments themselves. For this reason, Docrates Cancer Center takes advantage of PET-CT equipment in the treatment of an increasing number of patients: in order to effectively treat cancer, the exact location of the cancer must be known. 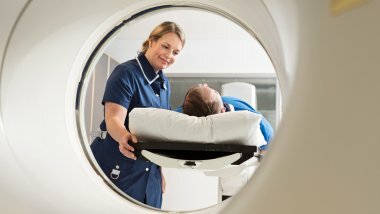 At Docrates, PET-CT is used for diagnosing cancer, the dose planning of radiotherapy and the assessment of the therapeutic response of new targeted drugs. We have also strongly invested in more specific tracers. Clinical usefulness is always assessed on a case-by-case basis, and no unnecessary examinations are conducted. 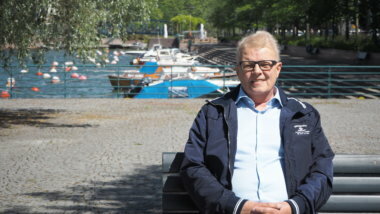 At Docrates, patients can access radionuclide examinations fast, and our multi-professional team under the leadership of the Chief Physician of Nuclear Medicine Jukka Kemppainen is responsible for the treatment. 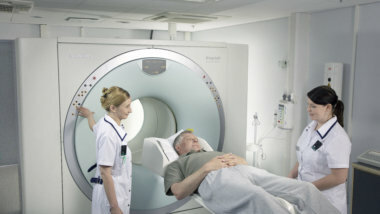 PET-CT is a demanding tool, the good utilisation of which requires a great deal of expertise. The producer of the tracers, MAP Medical Technologies, operates in the same building as Docrates Cancer Center. It has its own cyclotron used for the manufacture of tracers and a GMP-level laboratory. There are only a handful of cancer hospitals in the world that can so optimally take advantage of the location of a cyclotron and imaging equipment under the same roof. Learn more in which cases the isotope treatments are used at Docrates Cancer Center.